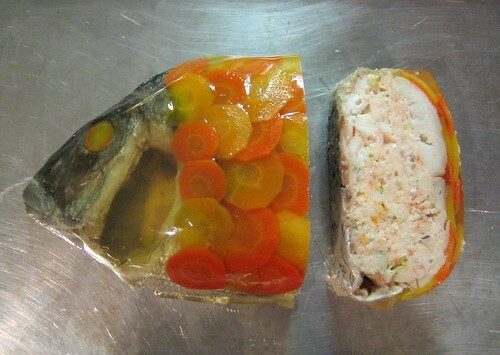 Petit jambon aux 5 sents en aspic et son découpage de truffes a l’encre. I’d still be a poor, sham of a man. 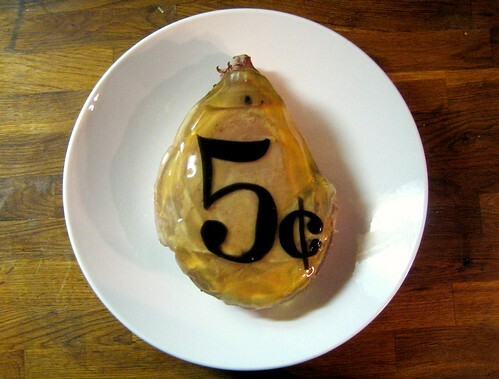 Singularly considered to be a subjectively smashing success, a cooked then jelly covered tribute to the District of Columbia’s premier bag tax (which has reduced bag consumption by 87%) and delectably absurd salty reminder to the avoidable 5¢ tax’s cheap opponents. An edible monument to the achingly inane whines against it that are being ranked on watercoolers in any progressive office where tolerance, paychecks and science fundamentals have evolved since the 1860’s. The first of its kind in the nation, the tax on bags from grocers and such was an effort to challenge wasteful “out of sight, out of mind” consumption, the revenue from which would be spent on cleaning up the filthy Anacostia river and Chesapeake Bay watershed. 6 out of 10 Residents of NW (North White) Washington support the tax where as the rest of the city is evenly split. Some of the tax’s opponents call the tax regressive on the poor or inconvenient and post their gripes on intrawebs. The poor for their part do not have intertron connections but are resourceful enough to circumvent the burdensome tax by bringing bags to stores if they deem the $0.05 fee to be so crippling, or they can go to the Anacostia River and pick up gently used ones for free. What is most ridiculously duplicitous and largely an indication of regressive political identity and intolerance is the white gentry that uses alleged plights of the poor as a shield & war cry while lamenting the 5¢ fee on bags for uppity sundries such as white wine & premium liquor (though they are happy to pay the 6% sales tax) and consciously deny impoverished residents a marginal fee destined to clean up their waterfront, a slummy waterfront that anyone with good enough sense, taste and money to enjoy Chateau Grincheux will avoid at all cost (to their BMW). 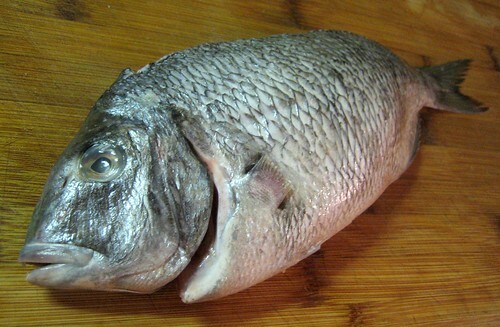 Almost looks like Victoria Jackson’s head, only smarter. Òste e còc enthusiastically supports the bag tax as it has reduced monthly bag use to 3 million from 22.5 million last year. However, an unexpected result of diminishing usage –either from environmental consciousness or thrift- is that far less revenue ($149,432 as of January 2010) may be generated than expected ($10 million over 4 years). Most remarkable is what a benign fee on a wasteful commodity can do to the human psyche and whatever loose change has accumulated in couches and car consoles. 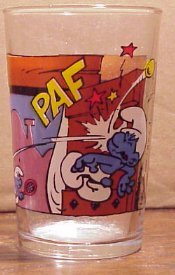 If only American food manufacturers were savvy enough to emulate Raymond Sachot, head of the French condiment company Amora, who in 1932 had the fabulous idea to package and sell mustard in reusable glasses ranging from Smurfs and Asterix to Minervois or Glenfiddich. The meat of the matter. The ham in question was originally attached to a 25 lb shoat from Pennsylvania. Having removed the femur bone, the thing was injected and cured in a 5% brine with spices (cinnamon, nutmeg, allspice, Old Spice, gorging spice, coriander and clove) for a fortnight. 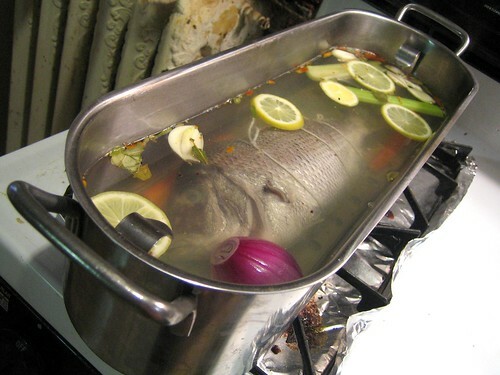 Once rinsed it was gently simmered in a smiling boil seasoned with salt, garlic, bay leaf and chili for 3 or so hours until the skin was tender and could be easily removed. 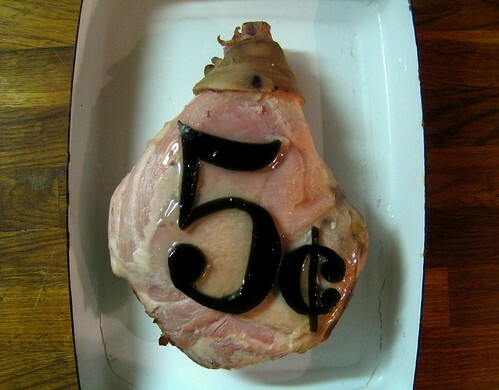 The ham was pressed in the fridge under a weight that was not being used in rigorous workouts at the time after which the skin was removed to expose the meat. Meanwhile, the trotter and a few beef knuckle bones were blanched then simmered overnight as with the previous aspic preparation. After cooling and de-greasing, the resulting jelly was clarified with egg whites loosened up with salt and vinegar then strained through a coffee filter. No truffles –neither winter, summer domestic nor imported- were available at the neighborhood Latino grocer so a facsimile had to be fabricated. For the impostor truffle découpage A portion of the aspic was colored with squid ink diluted in a scant spoonful of water and strained into a dish lined with plastic wrap. Typesets were researched until an appropriate Mr. Burn’s era Victorian theme to goof on the frugal curmudgeons was found, drawn freehand, cut and used as a stencil. 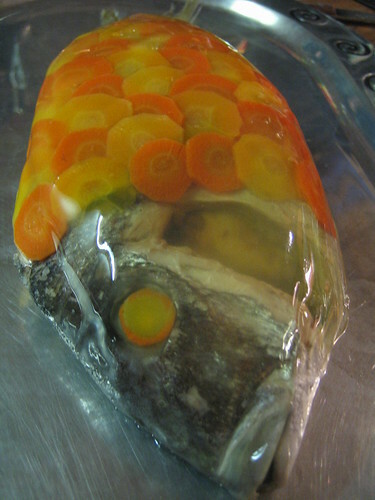 The clear aspic was pleasant to the taste. The ink one was certainly not. Charcoal tablets will be stolen from the hospital after the next post-binge visit as an alternative. The darker the Jell-O, the grosser the juice. 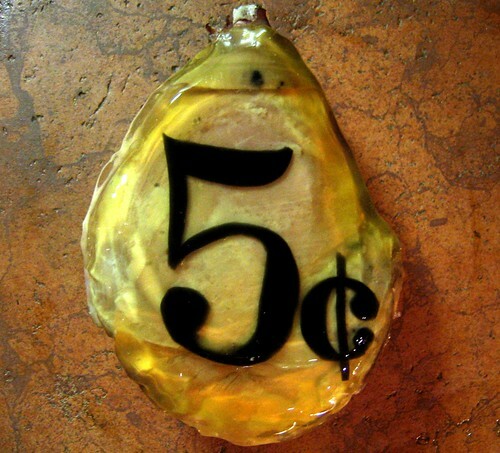 The segments of the second smallest denomination of United States currency were applied and after a couple spoonfuls of barely seized clear aspic to hold the fee in shape, the entirety was turned over into an oval dish into which clear aspic was poured. 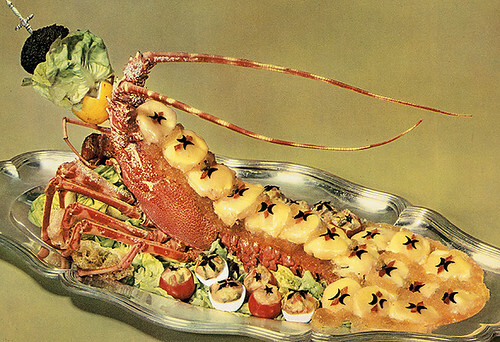 A butane torch was used to evenly melt away any excess aspic as use of the hair-dryer had been given up for Lent. Ad Haminem: Aesthetically, the ham and its cheeky flavored homonym were delightfully austere, the typeset properly amplifying the antiquated value of a nickel tax which that can be avoided through Pavlovian conditioning and which decreases as a percentage of what is efficiently packed into the bag to begin with. 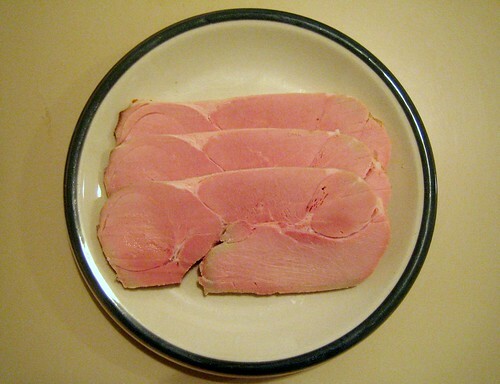 The ham was well seasoned without being too salty, fragrant, moist, nicely colored, tender and practical to slice in its boneless preparation. It could have benefited from a trip to the smoker which would have had the twofold effect of smoking the apartment, hopefully covering up the noxious poached-cod like odors of sister’s geriatric cat’s urine. Colonel Mustard ate it, in the dining room, with condiments.